I am previously from Tucson, Arizona and I lived in a rather large community called old Pascua. Old Pascua is closer to midtown rather than being closer to the casino which is on the far south side of Tucson.There are two Pascua Yaqui communities, Old Pascua and New Pascua. Where my family and I live is in the middle of Tucson. It is a neighborhood that is called old boss (Or better known as Old Pascua) and prior to that it was called the quad, because in the forties it was 40 acres of land. Jimmy Carter then put aside land before the tribe was recognized, and that’s the new village where my mother works. I am not Yaqui, but my entire life my family and I have lived, attended school and associated ourselves with the community. Whether we are helping with the ceremonies or teaching at the schools and volunteering, three generations of my family have lived and worked and made a life in the community. Starting with my great great grandma Hilaria, then my great grandma Carlota, to my Grandma, then my mom and me and my cousins. I am a fifth generation American, and have always been connected with helpers in the community. I, along with people in the community and church participate in a 40-day long ceremony at Pascua called Lent. Lent is a season that Catholics and Christians and even us, the Hiaki(Yaqui) tribe follow. It is forty days of following the steps of Christ, doing the stations of the cross and reenacting the steps and stories of Jesus from the bible. 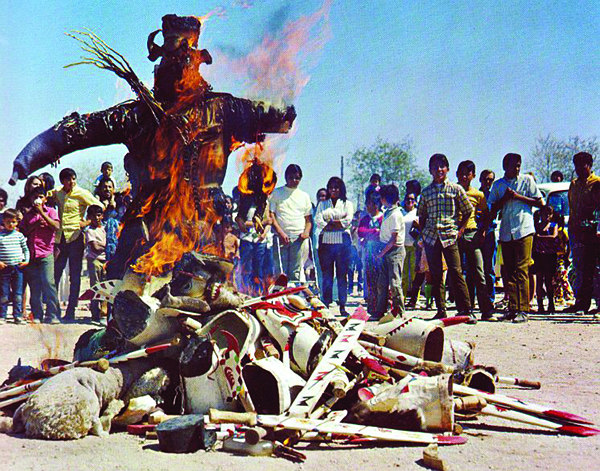 The actual ceremonies are both Yaqui and Catholic and even some pagan. The ceremonies are located on Holy grounds in the communities, at either old Pascua or new Pascua. The land is church land and sacred, having many rules and traditions. Some of the traditions include not being allowed to wear red on some days, not being allowed to eat meat on Fridays and not being allowed phones or cameras. There are two parts of the Easter Ceremony at Pascua. One is the Yaqui interpretation of the Catholic ceremonies for the Easter season, performed with reverence and devotion by the members of the church and community. There are people who dedicate themselves to reenacting scenes from the bible and impersonating the people from the bible, including; Jesus, Mary, Roman Soldiers and many more. They re-create the pursuit of Jesus, His capture and symbolic crucifixion. The ultimate defeat, when the church group and their allies ritually “kill” the evilness, or Roman Solider at “The Gloria” on Holy Saturday, are the main events of the drama, which unfolds simultaneously within the Catholic ritual and also the pagan one. It is ultimately the final battle when all the groups come together as one and have a giant and amazing fight.